Aggressive left-hand batsman and off spin bowler Suresh Raina being out from the Indian squad for more than 12 months made an applauding comeback. Justifying Coach Ravi Shastri as well as Selectors belief on himself, all-rounder Raina displayed fabulous performances in twenty20 International against South Africa. Considered as one of the best fielders in the side, Ghaziabad boy scored a dazzling 43 runs out of 21 balls and also taken one crucial wicket to help Men In Blue emerge as a victor. For his all-round show in the third T20, Raina was named as Man of the Match. Suresh Raina aged 31 years played 223 One-day Internationals regard as a finisher for team India was promoted to a no.3 spot to showcase his fearless batting skill in the last T20 against Proteas.It was very keen to see how Raina who last played a 50-over game back in Oct 2015 and has since struggled to get back into the team because of both form and fitness issues. Fighting against all the odds, he scored a massive run in Vijay Hazare trophy compelled everyone to notice his fitness and form. “He’s vastly experienced and he showed what experience can do. What I liked the best was he was fearless”. 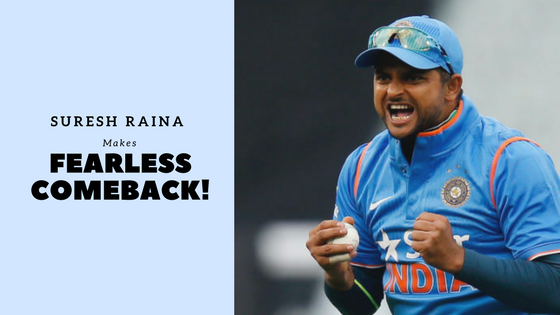 On many instances we have seen how veteran cricketers struggle after making a comeback to the squad but defying all the myth of pressure, Raina seemed like he was never out from the team with such an ease to watch his batting. Ravi Shastri on answering the question related to pressure on making comeback said “What I liked was the intent because normally when you come back into a side after a long period of time you can be playing for your place. And that can put added pressure on you. But he went out there as if he was never out of the side and batted in that fashion. It was very good to see”. Prior this series against South Africa he missed matches against Sri Lanka, New Zealand and Australia. Analyzing his whole scorecard in T20 series against RSA, Raina scored 89 runs at a strike rate of 153.44 which include two massive sixes and twelve boundaries. During the post match interview he said “I always play for the team and if we are winning trophies, individual performances will look after themselves. Whatever opportunity I get I look to play my natural game. I enjoy the team support and it helps improve my game”. In the upcoming World Cup, 2019 Indian cricket fans will be amazed to see Raina under his groove in Men In Blue T-shirt. Above that IPL season which is on the doorstep Raina form will definitely add thrill into the game. For IPL season 2018, Crix11.com team will let all our readers with pre match analysis and post match scenario. Stay connected with us for further news going around in the world of Cricket.